It was one of those beautiful summer days in Portland. We spent the morning taking category pictures for the Sarishop. Lucia is a great model and a draping whiz, so we could change costumes dozens of times! We had so much fun this day that it's only fair to share it all with you. This is Nancy and Lucia at the end of our photo shoot. A surprise phone call from some friends beckoned us downtown. Hey lets ride in our sarees! The girls are so game so first we worked out some tight well fitting drapes and did some test drives on the street in front of the house. Nancy captured all the action with her perfect eye and adventurous spirit. Riding a bike in a sari that is not equipped with a skirt and chain guard requires some careful tying as the cloth will billow into the spokes, get caught in the chain or drawn in under the brakes. Our first attempts proved far too elegant for sporty riding in traffic on our normal road bikes. With Chantal's book for inspiration, the best seemed like a dhoti type bottom with a kappulu style upper drape. I wrapped the pallu twice around my body, leaving a short pallu that is brought around under the front torso drape and tucked into the petticoat or choli to secure it. No flapping. Lucia started with a simple single wrap bottom tied high but eventually this proved to be a bit too revealing as the riding went on. These drapes are in still in development and I hope to share any cool things that come out of these future research activities. If you look closely at this picture you'll see that there is a clothespin holding the sides of the legs together for the ride. Never go out on your bikes without some of these! 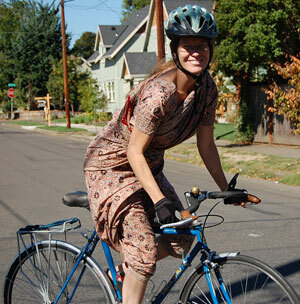 In fact, when riding in a nivi drape you can clothespin the pleats to the top tube to keep them from flying up over your legs. With no chain guard and a men's frame I settled with a modified dhoti style bottom with the legs tied on the legs tightly. The legs are made secure by pulling the cloth flat around the hips and tucking it around the waist in small even pleats. 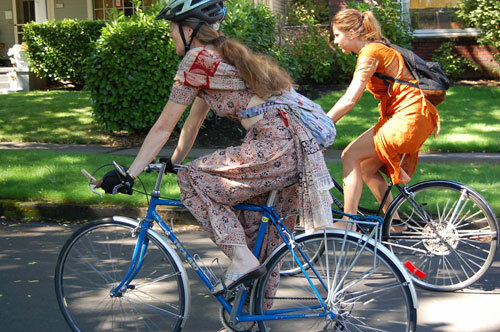 We ambled through the sun dappled streets of this lovely summery Portland Day. 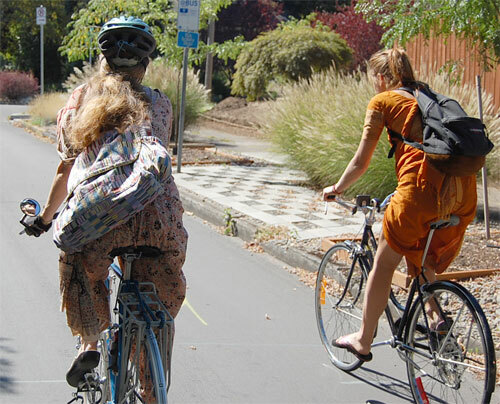 Portland Oregon is one of this great country's most bikeable cities, with many miles of bike lanes and trails and even groovy motorists who don't mind sharing the road. Nancy our own action photographer rode with us, camera in one hand, handlebar and brake, we hope, in the other and captured well the feeling of flight wearing a sari evokes. Riding through the park we decided to stop and adjust our loose ends. A warm wind was blowing across the field and as I undid the top knot the cloth started billowing out and in seconds the sari was airborn.